It is common knowledge that as a man ages he loses his athletic abilities. Physical abilities are one of the most common factors that are affected by aging. How many middle-aged men have you seen jogging in the park alongside you or hitting the gym with you for some light workouts? Men are at their prime when it comes to physical prowess during the late teens and early twenties. Gradually as time passes by there is a steady drop in physical performance and athletic abilities. Numerous factors are associated with this decline, ranging from low testosterone levels to underlying medical issues. 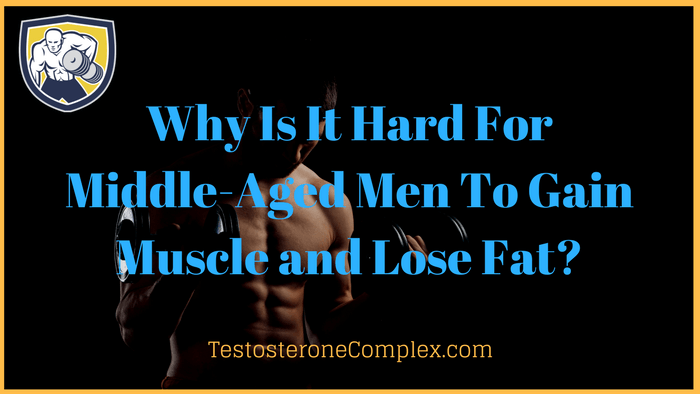 We shall have a look at the reasons why men over the age of 50 have a harder time gaining muscle/losing fat. After the age of 25, a man experiences a drop in testosterone levels each consecutive year. After 25 there is a drop of about 2 – 4 % in testosterone levels each year which can significantly impact body composition. As a man reaches the age of 50 he might have experienced a drop of about 35 – 45 % in testosterone levels. This drop can severely affect your ability to gain muscle or lose fat. As we all know, healthy testosterone levels are necessary for muscle building or fat loss goals. If we do not address this problem it can have a negative impact on your gym results. As we age our joints become worn out due to the cumulative stress on them over the years. This is the major reason why elderly people usually suffer from joint pain more than younger individuals. Calcium deposition in and around the joints reduces the mobility and causes stiffness. This calcium deposition occurs over the years and causes rigidity and strain. As a result of all this, our joints are not capable of rigorous exercise that is usually required to stimulate muscle growth. Lack of strenuous exercise can also cause a lot of fat gains. In addition to joint pain elder men also have mobility issues that prevent them from working out intensely. We all know that middle-aged men lack the flexibility and agility needed to perform dynamic exercises. Aging leads to muscle stiffness and rigidity. This can compromise your ability to perform certain movements in the gym. Additionally, older people are also prone to more injuries during workouts. Muscle pulls, injuries and spasms stem from a lack of flexibility in the musculature. Due to all of these reasons older men have a harder time working out with optimal intensity. If one doesn’t train with optimal intensity one cannot stimulate significant muscle hypertrophy(increase in muscle size). Older men generally suffer from a variety of ailments that can affect results in the gym. Diseases like diabetes, hypertension, elevated blood pressure and insulin resistance are common among older men. The diseases can interfere with the body’s ability to efficiently build muscle or burn fat. For example, insulin resistance increases the risk of being obese or overweight. Our body is a complex mechanism comprising of different organs and systems that work harmoniously to function properly. When the body suffers from some ailment a lot of bodily functions are affected either directly or indirectly. Thus, underlying medical issues can affect the ability to gain muscle or lose fat in elderly men. Over 50? No Need To Lose Faith! In case you’re above 50 years of age and are wondering whether your dream of having a fit body is doomed, let me inform you that it still is possible. No matter what the age, anybody can gain muscle or lose fat if they are willing to fix certain things. If you are above the age of 50, you could consider getting your testosterone levels back to normal. This is the first step you need to take in order to achieve results. Testosterone is a powerful hormone that can help men with muscle building and fat loss. Healthy levels of testosterone is associated with a better body composition. To boost testosterone levels naturally you could consider getting your diet and exercise regimen right. Opting for a natural testosterone booster can also help you as these are quite safe for consumption. In addition to this, you can try daily stretching and foam rolling along with your workout regimen. This can help your mobility and prevent injuries in the gym. By following the given steps you can achieve good results in the gym even after the age of 50. So eat healthy, exercise right and stay strong!